Cat Wilcox has left chilly Boston for sunny Mexico and a summer of girl bonding with her best friend, Sabrina. But—surprise!—Sabrina arrives with her boyfriend in tow. A boyfriend Cat didn’t even know existed until now. Suddenly, instead of spending her study-abroad semester building an orphan school with Sabrina, Cat’s facing a summer hammering nails all by her lonesome. Until she meets Aidan. He’s charming and thoughtful, and maybe into her. But she’s decided she’s done with boys…period. Still, between hiking in the rainforest, diving off waterfalls, and finishing the orphan center, Cat’s having a tough time sticking to her “just friends” motto. 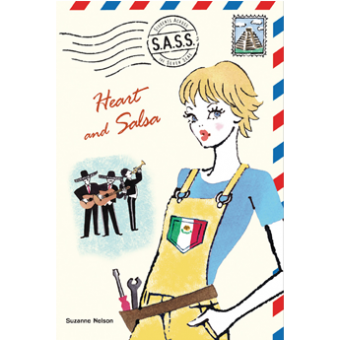 Can a little bit of salsa spirit give Cat a change of heart? Cat turned back to get in line for the rope seat. But everyone else had already gone ahead, except for Aidan, who seemed, surprisingly, to be waiting for her. “Thanks,” Cat said, feeling her heart quicken just a touch. The nature guide strapped Cat into the harness of the rope pulley, and when Amaranta gave the signal, Cat was lifted swiftly up through the cool mountain air. A walkway appeared through the swirling fog, suspended with ropes and winding through the treetops, and another set of pulleys deftly swung Cat onto it, with Aidan following right behind. After she’d regained her balance, Cat took in the scenery around her. Aside from the distant voices of the rest of the group echoing faintly every now and then, the cloud forest was peacefully quiet, and so beautiful. Heavy ferns dripping with dew hung from the trees, and flecks of brilliant color from orchids growing out of tree trunks spotted the milk-green horizon. “Wow,” Cat whispered. A sudden rustle in the branches above her made her jump, and she teetered on the edge of the walkway, nearly losing her balance. A pair of warm hands caught her around the waist. “I’ve got you,” Aidan said. Aidan dropped his hands quickly, shifting his gaze from her face to the trees….